Basic 5: Creams - Do You Know The Muffin Man? 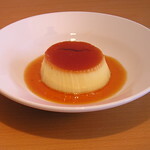 Crème caramel was our first product today. Chef began by demonstrating how to melt sugar to produce the caramel. After heating a pot on the stove, he tossed in granulated sugar a bit at a time, waiting until the previous handful had melted. This, he explained, along with a minimum of stirring with a wooden spoon, was to ensure that the caramel would not have lumps. In volume production, Chef said a bit of vinegar is added to prevent crystallization. The caramel was poured into foil ramekins and left to cool. We made the custard by heating whole milk, adding sugar, and pouring the mixture into beaten eggs. Adding the sugar into the milk, rather than the eggs, is supposed to prevent the milk scum from forming. 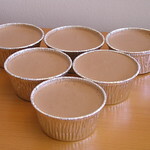 The mixture is sieved, poured over the caramel, and the cups are placed in a water bath and baked in the oven. Next up was bavarian creams. I whisked together eggs and vanilla while my partner heated the milk. Since the creams aren't cooked, we made sure it came to a boil to kill any nasties in the eggs. Sugar and gelatin are added to the milk, and the mixture is poured into the beaten eggs. Chef proudly told us that we were flavouring our creams with chocolate, a move that the College didn't really approve of. He said that since this class might be a once in a lifetime thing for some of us, he wanted us to have the good stuff. Next, we made whipped cream. By hand! Our instructor demonstrated how to use a balloon whisk to beat the cream from side to side, sort of in a Z-shaped motion. After a few minutes, it began to thicken, and we combined it with the chocolate mixture. This was poured into cups and placed into the fridge. We were told to come back in about an hour. During the break, two classmates and I went to Toba for brunch. We talked about class and one woman said that she was looking forward to the more advanced courses since she already knew how to make what we've been doing. I also pointed out that the mise en place is already done for us; I'd rather we scale things ourselves so we get a feel for it. The next day, after 24 hours in the fridge, I inverted the crème caramel without any problems. My attempts in the past using ceramic custard cups were not so successful: the caramel was still solid and stuck to the cups, even after two days of refrigeration. I remember enjoying this at the Mandarin when I was young but not knowing what it was called. This is a pretty simple dessert to make and can be varied with all kinds of flavourings. The bavarian cream was alright, deceptively light, but the chocolate taste wasn't very intense.